Of course this is what can be expected with the decision-making system we have. When each and every of 25 able politicians who are only answerable to their own constituencies can veto an agreement any time they like, and when the whole thing has to be brokered by another able politician who is only answerable to his own constituency and has a giant stake in the outcome, the result is bound to be riddled with the effects of pork barreling. However, after the defeat of the European Constitution last summer and subsequent grandstanding on “reform” and “leadership” and “reconnecting Europe to the people”, this is much, much worse than what could be expected, even within the constraints posed by reality. The UK’s long-awaited proposal for the EU’s new long term budget, the first one since the collapse of negotiations at the June EU summit, was finally published on 5 December in the evening. Other member states had already been claiming that the proposal came too late, leaving no time for negotiation. When it finally arrived, nearly all member states reacted negatively (“cynical”, “a very good proposal – for Britain”, “it’s like the Sheriff of Nottingham – stealing from the poor to give to the rich”), so much so that it took only two days for the UK to announce an adapted proposal. This second proposal was published on Wednesday. However, even if the publicitary backlash made the British government decide to offer a little more to the new member states than in its first proposal, the second proposal marks no substantial improvement. For this, both versions fail to address too many difficult but urgent matters. In fact, they fail to address them all. 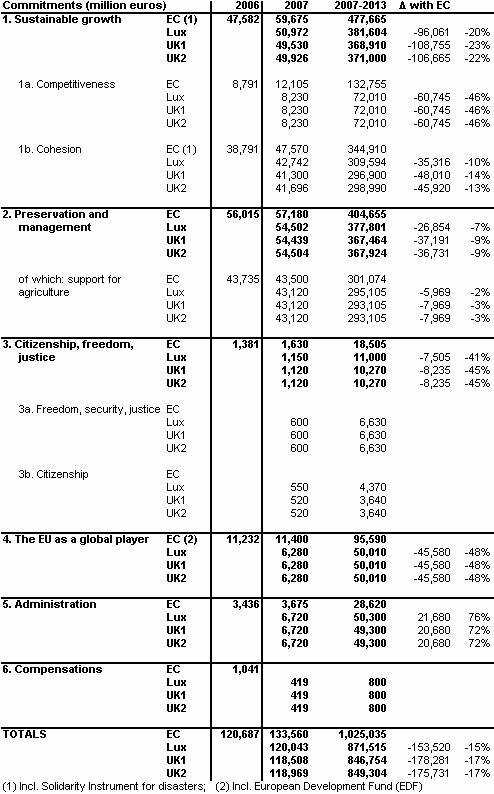 First some numbers in the table below, where UK1 refers to figures from the UK’s first and UK2 to its second proposal. For comparison, the amounts proposed by the European Commission (EC) and Luxembourg (Lux) are included too, as well as relative and absolute differences with the Commission proposal. The table gives figures for 2007 and for the entire 2007-2013 period. To allow for comparison with current spending levels I have also included figures for 2006, which belongs to the current, 2000-2006, Financial Perspectives. For a more detailed explanation of how the budget is composed and how EU budgets work, see aforementioned Finances in perspective. Thirdly, implement the Lisbon Agenda. On jobs, labour market participation, school leavers, lifelong learning, we are making progress that nowhere near matches the precise targets we set out at Lisbon. That Agenda told us what to do. Let us do it. And look what they did: this chapter sees the biggest cuts in absolute terms of all chapters in the entire budget. And from what remains, 500 million per year is to be spent on a “Globalisation Correction Fund” to compensate regions hit by mass job losses caused by “globalisation” – and failing government. One of the largest cuts compared to the Commission proposal comes from chapter 1b, cohesion. These are the funds for poor regions, most of which are spent in the new member states. This is also one of the biggest extra cuts the UK presidency makes to the Luxembourg proposal of June, although in absolute terms, the Luxemburg cut is much larger. That the fuzz is much bigger this time, however, may be due to the fact that Blair took it specifically from the new member states, where Luxembourg tried to spread it more evenly. Another large cut is taken in chapter 2, where 10 billion comes from funds for rural development and environmental policy. That all time favourite, the Common Agricultural Policy, however, is not touched – except for a clause saying that by 2008 the Commission should make a “comprehensive and wide-ranging review, covering all aspects of revenue and expenditure, including, inter alia, the Common Agricultural Policy, and the UK rebate.” There is however nothing substantial in the review clause as to the direction that review should take. It should be noted that the rural development and environment funds of this chapter also include the agri-environmental subsidies on which I wrote earlier. I suppose these would be the only budget cuts I should welcome, as I concluded that this reformed version of the CAP especially should be renationalised, at least partly. On the other hand, cutting these funds would so be in contradiction with current policy trends that I doubt it was done deliberately (or that these funds, rather than the environmental programmes of chapter 2, are envisaged at all). Chapter 4, “Europe as a global partner”, sees large cuts in external aid. Funds for humanitarian and emergency aid, development cooperation, the European Neighbourhood Policy (assistance for democratic and economic development and stability in the countries surrounding the EU) are almost cut in half. It should be noted that the Commission figures do include the European Development Fund (EDF, about 3.5 million euros per year) which, as an intergovernmental instrument, is currently left outside the EU budget, and remains there in the Luxembourg and UK proposals. But even with the EDF taken into account, the cuts in chapter 4 are substantial and – especially with regard to the European Neighbourhood Policy – not at all in Europe’s interest. Interestingly, considering current policy priorities, chapter 3 on security and justice sees itself cut almost in half as well by the Luxembourgers and cut a little further by the UK. Although this may rejoice those of us (including myself) who are worried that the fight against terrorism is often taken a little too far, it is a little strange considering Blair’s own priorities and the fact that the fight against organised crime and terrorism is among the EU policy areas that has the strongest popular support. Under chapter 1a, 375 million euros is allocated to Slovakia and 865 million to Lithuania for decommissioning the nuclear power plants of Jaslovske Bohunice and Ignalina. In chapter 1b, the maximum amount Poland can receive from the cohesion funds is increased for the 2007-2009 period “in order to reflect the value of the Polish z?oty in the reference period”. The K�z�p-Magyarorsz�g region in Hungary, the Prague region in the Czech Republic, Estonia, Latvia and the Spanish territories Ceuta and Melilla receive extra funding under the second proposal, as well as several regions in other countries that were already in the first UK and the Luxembourg proposal. The “retention costs” the Netherlands may keep for collecting EU import duties are increased from the current 25% to 40% of the amount collected. The real costs of collecting such duties would be less than 5%. This measure is only temporary, for the 2007-2013 period only. Sweden, Germany and the Netherlands see their VAT contribution to the EU budget reduced, whereas the Netherlands and Sweden also get a reduction on their GNI-based contribution to the budget. These measures too are temporary. As a gift to itself and to its difficult tabloids, the UK offers to reduce its rebate to a level that is lower than it would be otherwise but that is still higher in absolute terms than it is now. It proposes no change to the ridiculously complicated system of calculating the rebate, nor does it adopt the Commission’s proposal of transforming the rebate into a generalised correction mechanism that would apply to all countries whose net contribution is higher than reasonable. So whoever threatened with a veto is rewarded with extra money, irrespective of the strength of his case. Whoever did not threaten with a veto, for instance out of fear of retaliation in other dossiers, is mercilessly exploited by the rest. None of the structural problems and challenges of the Union is dealt with. None of the policy priorities of the Commission and most governments receives extra funding. There is no solution for the CAP. There is no solution for the net inequalities caused by the EU’s funding system. There is no investment in future economic growth by providing extra money for research, and for better infrastructure in the new member states. People say: we need the Budget to restore Europe’s credibility. Of course we do. But it should be the right Budget. It shouldn’t be abstracted from the debate about Europe’s crisis. It should be part of the answer to it. Indeed it should have been. If what the government leaders eventually come up with is close to what is currently proposed, the Commission and the European Parliament owe it to their role as supranational guardians of the common interest to use their veto to block its adoption. Nowhere in the Treaties does it say that the annual budget procedure requires an agreement on Financial Perspectives. The fact that ordinary budgets are decided with qualified majority voting (QMV) – where unanimity applies for the Financial Perspectives – can only be an advantage. Anything is better than to be stuck with this failure for seven years to come. * update Sat 17 Dec 13:10 (GMT+1) * There is an agreement now. The text is not yet on-line (update Sun 18 Dec: it is now), but from what I understand the UK agreed to a little extra reduction of its rebate (which still continues to grow) while the budget as a whole increases to 862.4 billion euros. Poland apparently received an extra christmas gift of 4 billion euros, and the Netherlands sees its BNI contribution reduced by another 0.4 billion euros compared to the previous offer (which makes it an average, instead of the largest net payer relative to BNI or head of population). The clause on a general budget review to take place in 2008 (including CAP and rebate) has not changed – i.e. nothing substantial there. Barroso is happy. My hope is on the European Parliament now. This entry was posted on Friday, 16 December 2005 at 13:45	and is filed under Budget & Finance, European Politics. You can follow any responses to this entry through the RSS 2.0 feed. You can leave a response, or trackback from your own site. I’ve always thought things like this suggest that the majority of the EU’s problems are caused by the leaders of Governments, who spend a lot of their time grandstanding, pork-barrelling, trying to push their own agenda to make themselves look good and get relected back home and otherwise blaming the EU for problems that are not of its making (and often blaming decisions where that county’s representitives have previously supported). Some examples are the location of the Parliament, the CAP and, of course, the budget. It seems that the Commission and the Parliament are ‘better’ at deciding what is best and sensible for the EU and its members as a whole as they don’t have to make stupid, short-term decisions for the benefit of their domestic audience (and often, domestic media/political backers). However, the Commission not being elected would mean getting them more involved in such decisions would be hard to sell. I forgot to add that the idea of a percentage tax on all member states that is spent as decided by the commission according to a *general* framework created by the Parliament/Council is one that appeals. It’s funny how every single leader went back home declaring ‘victory’. It was the budget deal that everybody won. Though Marcinkiewicz got it in the neck from his rightwing mates in parliament. Merry Christmas, and thanks for the detailed posts this year.